All of us in our day to day life use insurance products some or the other time. For me, the most commonly used insurance product is travel insurance whenever I go abroad. Taking out a travel insurance is so easy, you can go online compare prices and see what works out for you. I have been lucky to not claim under travel insurance but having it gives me a peace of mind. If you travel a lot, then make sure that your travel insurance policy offers comprehensive coverage. 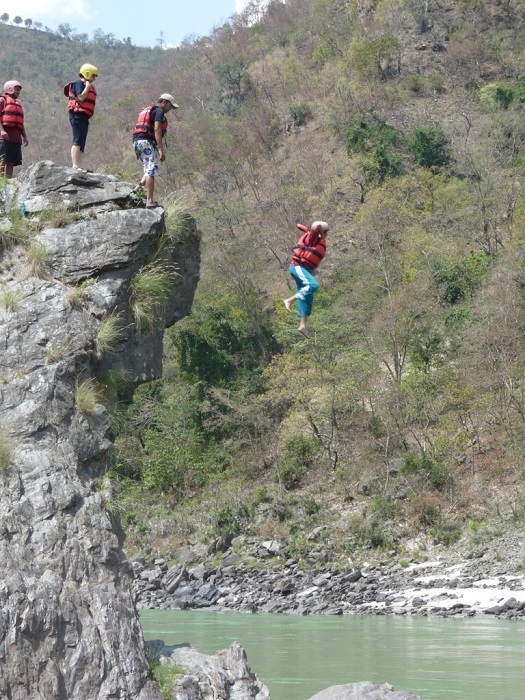 Cliff Jumping- That is Me! Most of the common travel insurance policies would not cover adventure travels. Do read the fine print and only then take out the policy. The next most commonly used insurance product for me is car insurance. Once again car insurance can also be purchased or renewed online. Also showrooms, from where you bought the car, take care of car insurance renewal. I am lucky that the showroom from where I bought the car from reminds me every time about the renewal. They also send someone to collect the check. The third most common insurance that I use is the medical insurance. I am covered from my husband’s company. We have used medical insurance twice for his hospitalization, they were minor operations. But the medical bills were large. His medical insurance company offers excellent service, so we never had any issues in claiming the amount. Most of the medical insurance companies offer 90% cover for medical costs, while 10% have to be paid by us. Buying a general insurance policy is easy, but selection of the best one requires you to look at important factors such as the customer reviews and track record of the company when it comes to honoring a claim. I hope all of us are lucky and we never need to use any kind of insurance, but if we are in need and if it is difficult to claim the insurance, then what is the point of having insurance in the first place? So what is your insurance story? Do share in the comments. Even though I never had to use my travel insurance while traveling abroad, I have realized the importance of knowing what is covered and what is not. 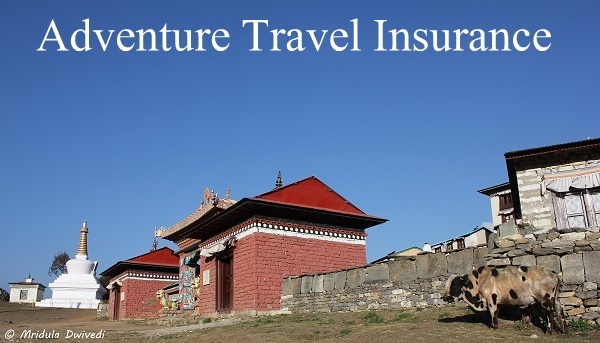 Adventure travel insurance is different from normal travel insurance! And I learned it at my cost! When I was trekking to the Everest Base Camp, in Nepal I had this unnerving chat with my trip provider Puru of ‘Above the Himalayas’. He asked me, “So do you have helicopter evacuation cover?” Now this completely stumped me. It was May of 2012. I had a normal travel insurance policy. Sitting in his office I realized that most of them do not cover adventure sports! 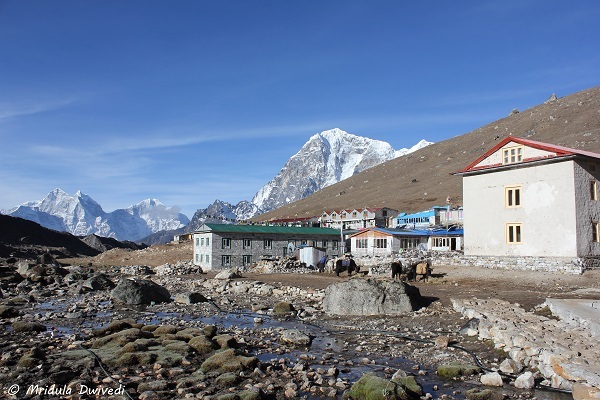 I decided to proceed on the trek without any insurance cover, nothing to say what about emergency evacuation cover. In India helicopter rescue is anyway not common. But in Nepal it is possible and effective. I came back from the trek safely to tell the tale. But I have learned my lesson. It is extremely important to know what is being covered rather than just looking at the lowest price! In 2013 I trekked in Nepal again with the right kind of travel insurance cover, I took it out with World Nomads. Being a Pillion Rider can Pose Risks! 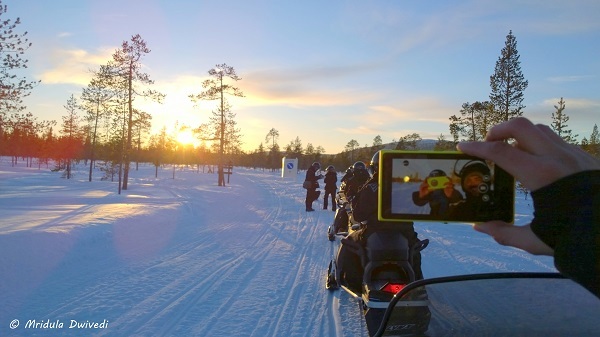 Then I went as a pillion rider, in 2014, on a snowmobile in Lapland, Finland with a daredevil who answers by the name of Mark Pedro Hindle. He drove at such a speed that I suddenly became conscious of how brittle my body was and how many bones it had, all of which breakable! I worried about my neck getting broken, I was happy for the helmet I wore and other protective gear I had. I actually thought of my father during the drive and how upset he would be if I ended up in a hospital in Finland. I was lucky that my sponsors for the trip, Nokia, were bearing my medical expenses. While my thoughts were a confused muddle, I maintained an outwardly calm. Mark promised that I only needed to scream to let him know that I wanted us to go faster! I cannot tell you how relieved I was when that ride was over. Mark is a thorough gentleman when he is off the snowmobile. I asked him if he had gone snowmobiling before and he said his favorite is dirt biking. I immediately understood where he was coming from! The lesson I learned this time was to know your rider before you go and get attached as a pillion! And you need to avoid daredevils with a penchant for dirt biking at all costs. Do you have any adventure/travel insurance stories to share?